ANIMAL BIOACOUSTICS is the study of sound production, processing and perception in non-human animals. It includes within its scope the following: animal communication and associated behaviors, sound production anatomy, analysis of animal generated sounds, auditory capacities and mechanisms of animals. It also includes the use of instrumental sonar for animal population assessment, identification, and behavior, as well as the effects of human-made noise on animals. The Biomedical Acoustics TC is concerned with study of the interactions of acoustic waves with biological materials, including cells, tissues, organ systems & entire organisms. Interest areas include: Diagnostic and therapeutic applications of acoustics in medicine, Biological effects of exposure to mechanical vibration and acoustic waves, Acoustic propagation in biological materials, Instrumentation, Ultrasound field calibration, exposimetry and dosimetry, Ultrasound contrast agents, Medical image & signal processing, Characterization & processing of biological materials, Physiological measurements. The Technical Committee on Engineering Acoustics is concerned with the evolution and improvement of acoustical techniques and apparatus, and with the promotion of new applications of acoustics for useful purposes. The areas of Transducers and arrays, Underwater acoustic systems, Acoustic instrumentation and monitoring, Applied sonics, promotion of useful effects, information gathering and transmission, Audio engineering, Acoustic holography, acoustic imaging and Acoustic signal processing are of particular interest. 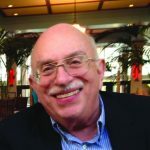 We are starting a new feature in our “Sound Perspectives” section that will appear in each spring and fall issue of Acoustics Today (AT), a list of the various awards and prizes that will be given out and the new Fellows who will be honored by the Acoustical Society of America (ASA) at the spring and fall meetings (awardees and Fellows in this issue of AT will be honored at the Spring 2019 Meeting). The idea for including this list came from ASA President Lily Wang, and I thank her for her suggestion because inclusion of this list further enhances the ways in which AT can contribute to our Society. Links to the individual articles in pdf format are below. To view the full magazine on-line in flipbook format, click here or simply click on the cover image. Click here to download the pdf. 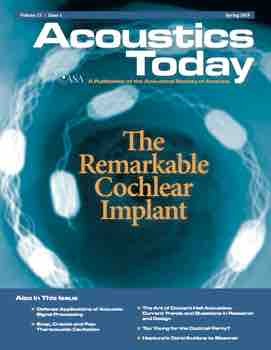 Scientists with Hearing Loss Changing Perspectives in STEMM – Henry J. Adler, J. Tilak Ratnanather, Peter S. Steyger, and Brad N. Buran.